This recipe for Buttery Nut Toffee produces a rich, dark toffee studded with crunchy nuts. An optional dipping of melted chocolate adds a smooth, sweet finishing touch. 1. Prepare a 9x9 pan by lining it with aluminum foil and spraying the foil with nonstick cooking spray. 2. Combine the butter and sugar in a medium saucepan over medium heat. Stir to melt the butter, and continue to stir while the mixture boils, until it reaches 240 degrees (soft-ball stage). 3. Stop stirring, and continue to cook the candy. Monitor the candy carefully, and stir occasionally if it appears to have “hot spots” or to be getting too brown in places. If the mixture ever appears to separate, stir vigorously until it comes back together. If desired, use a candy thermometer to get an exact read. 4. Once the mixture reaches 270 degrees, turn the heat to low and watch it carefully. If you are using an electric stove, you might want to move it to another burner turned to low, so that it does not overheat. Cook the candy on low until it reaches 306 degrees, watching carefully and stirring only when necessary. 5. As soon as the candy reaches the proper temperature, remove it from the heat. Add the nuts and stir a few times to distribute them, then pour the candy quickly into the prepared pan. Tilt the pan to spread the candy to an even thickness. 6. Let the candy sit for a few minutes, and once it begins to set, score the top into squares with a sharp knife sprayed with nonstick cooking spray. 7. Allow the candy to cool fully at room temperature, then break it apart along the previously scored lines. 8. If desired, the toffee pieces can be dipped in melted chocolate. To prepare toffee this way, melt the chocolate chips in the microwave, stirring after every minute to prevent burning. Allow the chocolate to cool slightly, then dip individual pieces into the chocolate using dipping tools or two forks. Place the dipped pieces on a foil-lined baking sheet, and allow them to set in the refrigerator. 9. 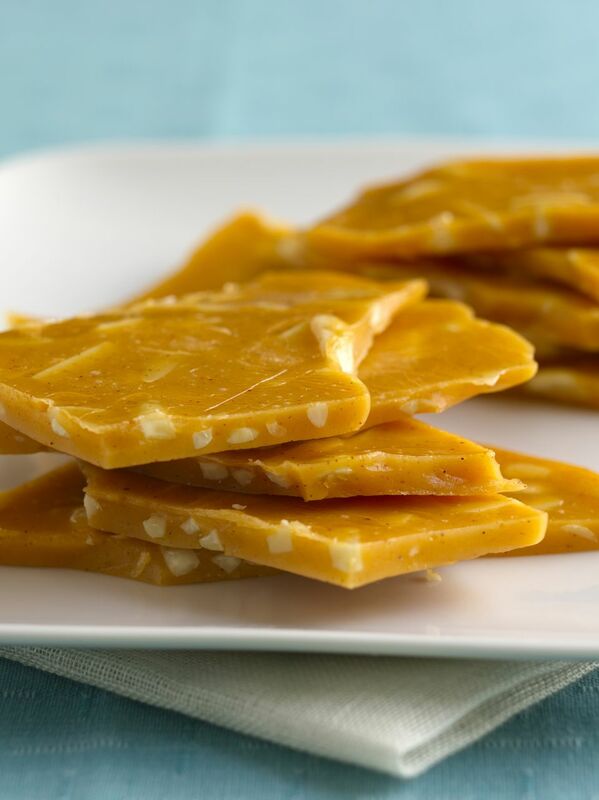 Store toffee in an airtight container at room temperature or in the refrigerator. Chocolate-dipped toffee should be stored in the refrigerator, but served at room temperature.